My foster parents officially adopted me today 1/31/12. Whoo-hoo! Hi! 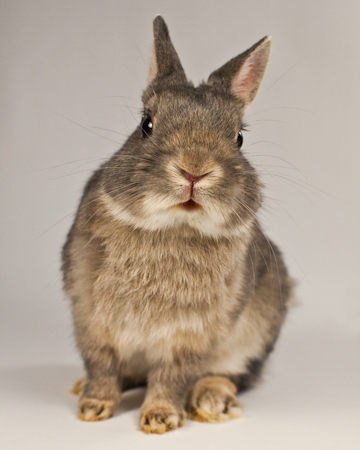 My name is Ash and I am a super cute and little neutered Netherland dwarf boy. Can you see how tiny and perky my ears are? I'm also only about 2 1/2 pounds. As a little guy, I do tend to be a bit more squirmy and skittish than some of the bigger bunnies. I'd be a good pick for an adult or experienced bunny guardian--more so than for kids who might not be quite gentle enough to handle a delicate little bunny like me. If you are looking for a "cuddly" bunny to hold---that's not me. Cuteness galore, yes. Hold still for cuddles, not me!